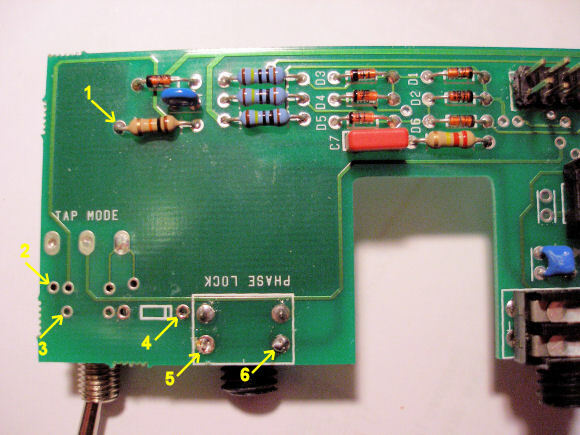 This page describes how to modify an M28 Tap Clock so that it inverts the incoming clock signal, to make it compatible with the software upgrade. The first section describes in detail how to do this for Rev 1.0 boards, then further down the page the procedure for Rev 1.2 boards is given (in more of an outline style). 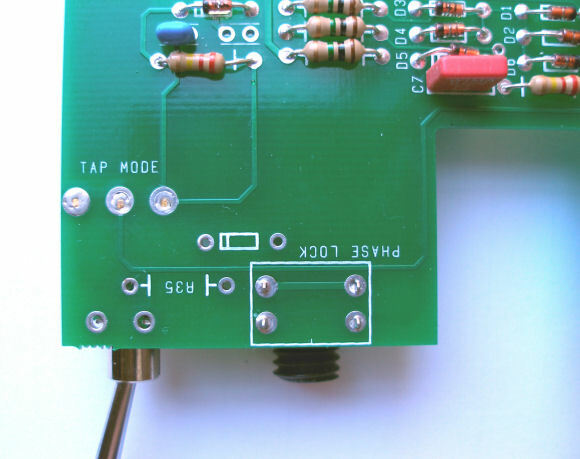 The modification is made to the component side of the 'jack board', which thus needs to be removed from the module. First gently ease off the ribbon connector which goes to the main board. Then undo five nuts on the faceplate: the 'tap' toggle switch and the three other jack sockets in a line vertically below it, soldered to the one side of the board; the fifth nut belongs to the left-most 'accent' socket which is soldered to the other side of the board (and note that none of the nuts on the toggle switches running across the module need to be removed). The board should now be loose, but won't quite come straight out: pull it back so the jack sockets clear the faceplate; then rotate the bottom outwards so the inner socket clears the 'switch board' running across the module, and then it can be pulled further back to completely remove it. 1. 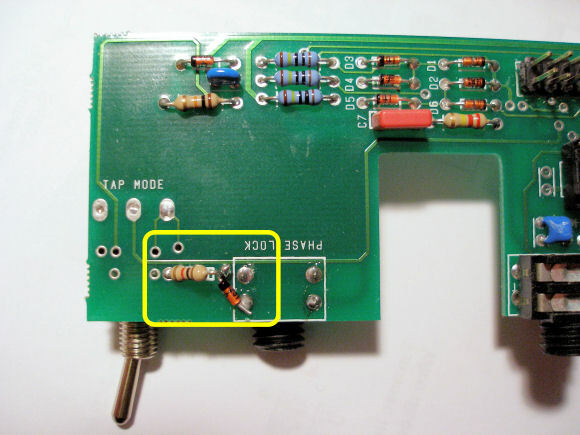 Add a 22kΩ resistor between the leg of the 10kΩ, point '1', and via '2'; when bending and cropping the leg to fit through the via, ensure that it is kept short enough so there is no chance it can touch the toggle switch on the other side of the board. 2. 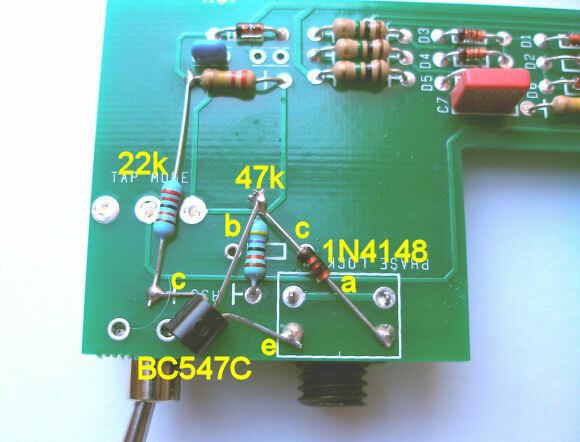 Bend the leg of a 47kΩ resistor close to its body, crop it off, and solder into via '4'; bend the other leg up, away from the board. 3. 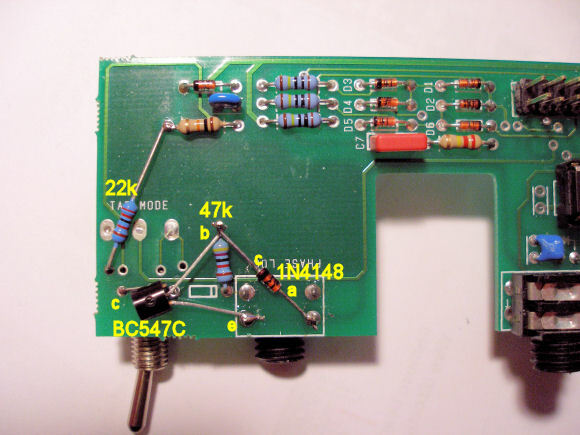 The BC547C is fitted with the flat face to the board: bend the collector under the body, and then bend the tip to fit through via '3', and solder in place (again taking care to ensure it cannot touch the toggle switch on the other side of the board); splay the base and emitter so that the emitter can be soldered to pin '5', and the base to the end of the 47k. (If a different type of transistor is used, ensure the 'c', 'b' & 'e' connections go as shown). 4. Solder the anode end of an 1N4148 diode to pin '6', and the cathode ('black band' end) to the 47k/base connection; crop the leg of the resistor close to the solder joint. Check that there are no leads touching anything they shouldn't (the vias under the collector leg of the transistor are all on the same track, so that is not a problem), and re-insert the board into the faceplate and re-attach the ribbon from the main board; replace all the nuts on the switch and the sockets, and finally double-check that none of the new leads sticking through the board can make contact with the shell of the toggle switch. 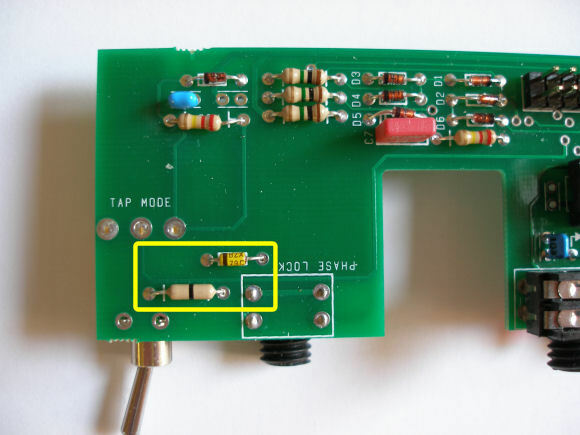 If you have a Rev 1.2 board, the procedure is very similar to the above, the only differences being that some of the attachment points are slightly different (so read that section first, especially about disassembling the module, and checks made after doing the mod! ).